Objectives: To compare the efficacy and tolerability of butterbur (Petasites hybridus) with cetirizine in patients with seasonal allergic rhinitis (hay fever). Design: Randomised, double blind, parallel group comparison. Setting: Four outpatient general medicine and allergy clinics in Switzerland and Germany. Participants: 131 patients were screened for seasonal allergic rhinitis and 125 patients were randomised (butterbur 61; cetirizine 64). Interventions: Butterbur (carbon dioxide extract tablets, ZE 339) one tablet, four times daily, or cetirizine, one tablet in the evening, both given for two consecutive weeks. Main outcome measures: Scores on SF-36 questionnaire and clinical global impression scale. Results: Improvement in SF-36 score was similar in the two treatment groups for all items tested hierarchically. Butterbur and cetirizine were also similarly effective with regard to global improvement scores on the clinical global impression scale (median score 3 in both groups). Both treatments were well tolerated. In the cetirizine group, two thirds (8/12) of reported adverse events were associated with sedative effects (drowsiness and fatigue) despite the drug being considered a non-sedating antihistamine. Conclusions: The effects of butterbur are similar to those of cetirizine in patients with seasonal allergic rhinitis when evaluated blindly by patients and doctors. Butterbur should be considered for treating seasonal allergic rhinitis when the sedative effects of antihistamines need to be avoided. What is already known on this topic Seasonal allergic rhinitis (hay fever) is common in countries with temperate climates. The usual treatment for seasonal allergic rhinitis is antihistamines. These reduce rhinorrhoea and sneezing but are less effective for nasal congestion and may cause sedation and drowsiness. The availability of corticosteroid nasal sprays without prescription has increased their use by patients with allergic rhinitis. Similarly, antihistamines can be obtained over the counter for treatment of hay fever, and all may interact with alcohol and decrease driving ability.9 We conducted a randomised controlled trial of butterbur extract tablets (ZE 339) and a commonly used non-sedating antihistamine (cetirizine) to compare the effectiveness of these two treatments. All participants were outpatients attending four general medicine and allergy clinics between June 1999 and June 2000. All physicians were experienced in using the instruments of assessment and had training in use of the scales before the study to enhance intercentre and intracentre consistency. In each clinic, all assessments were made by the same person. Study medication consisted of butterbur (petasites carbon dioxide extract ZE 339 standardised to 8.0mg of total petasine per tablet; one tablet, four times daily) or cetirizine (one 10 mg tablet daily), as recommended by the manufacturers. Blinding was assured by the use of “double dummies.” Each day, participants took five tablets, four of which contained either placebo or butterbur, and one contained either cetirizine or placebo, depending on the treatment group. The study was performed according to current European Union and International Conference on Harmonisation guidelines on good clinical practice and the Declaration of Helsinki on Human Rights. The study was approved by the relevant ethics committees in Germany and Switzerland. All participants were aged ≥18 years, had a history of seasonal allergic rhinitis for at least two consecutive years, and fulfilled the seasonal allergic rhinitis diagnostic criteria (box). We excluded patients who had a history of alcohol or substance abuse; were pregnant or breast feeding; had parasitic disease causing increase in IgE or eosinophil levels; had taken corticosteroids in the past two months, antihistamines in the past six weeks, or anti-inflammatories in the past two weeks; had perennial (non-seasonal) rhinitis; had received an organ transplant; or had serious concomitant disease. Items A, B, C, and D must be fulfilled for each patient. Baseline assessment was made at the referral consultation, when the inclusion and exclusion criteria were checked. All participants had skin allergy tests, and all but one were allergic to pollen, most commonly grass pollen. They also had a full medical examination and laboratory tests (haematology, biochemistry, pregnancy test), after which they were given enough treatment for two weeks. The acute nature of the illness meant an initial placebo phase was not appropriate. Participants could return after one week if they experienced adverse events or deterioration. At the visit at the end of week 2, participants had a full medical examination and laboratory tests (haematology, biochemistry) and we checked compliance and adverse events. Exposure to pollen was confirmed for each participant through crosschecking the treatment period with the online regional pollen count service (http://www.pollenallergie.de/). All data were processed and analysed by the University of Giessen's department of medical information technology. Randomisation was provided centrally in blocks of four. Analysis was on an intention to treat basis, defined as all randomised patients who had at least one baseline and one follow up value and took any medication. The planned sample size was a minimum of 120 patients, based on previous studies of allergic rhinitis, 10 11 with a 10% expected withdrawal rate and an assumed effect size of 0.5. The main efficacy variable was change from baseline to end point in the score of each item on the medical outcome health survey questionnaire (SF-36), a validated tool for patient self assessment in this condition.11 Questions are grouped hierarchically in eight categories with a total score range of 0-100 per item, and the questionnaire also includes one category with a five point score for comparing severity of the condition with that in the previous year.The secondary efficacy variable was the physicians' clinical global impression score.12 The hypothesis was that butterbur was not inferior to cetirizine at the end point, defined as within 10% of the SF-36 score or one point in the clinical global impression score. The analysis followed a sequential confirmatory method of testing the hierarchically ordered items of SF-36 regarding changes in individual scores, whereby the main group is declared inferior when an item shows inferiority at any point during the testing sequence. The experimental probability of type 1 error is α=0.05; one sided, with 80% power (with a minimum sample size of 50 patients per group). The null hypotheses were tested in a hierarchical sequence of rejecting hypotheses, whereby the procedure stops if the null hypothesis is accepted in the previous step. Values were calculated with 95% confidence intervals. Non-inferiority was tested by the Mann-Whitney rank sum test (one sided), and between treatment comparisons were tested by the Mann-Whitney test (two sided). We used the Shapiro-Wilk test for non-normally distributed data. The exploratory secondary variables were evaluated by inference statistics with a shifted null hypothesis adjustment to baseline according to the method of Abt,13 with means, standard deviation, medians, 95% confidence intervals, minima-maxima, and absolute and relative frequencies. For participants who withdrew we carried forward the last observation. The mean of both treatment groups was used to substitute missing values. A total of 131 patients were initially screened, and 125 were randomised (figure). Participants' characteristics at entry were similar in the two groups (table 1). The population was representative of patients with seasonal allergic rhinitis who seek treatment in the primary care sector, two thirds of patients being women and one third being smokers. All four main symptoms of the illness were moderately severe or worse in most participants (table 1). Rhinorrhoea was most commonly reported as moderately severe or worse, with sneezing, nasal congestion, and itchy eyes or nose having similar frequency and severity in both treatment groups. About half of patients thought their condition was worse than in the previous year. Table 2 shows the results at the end of the treatment period. 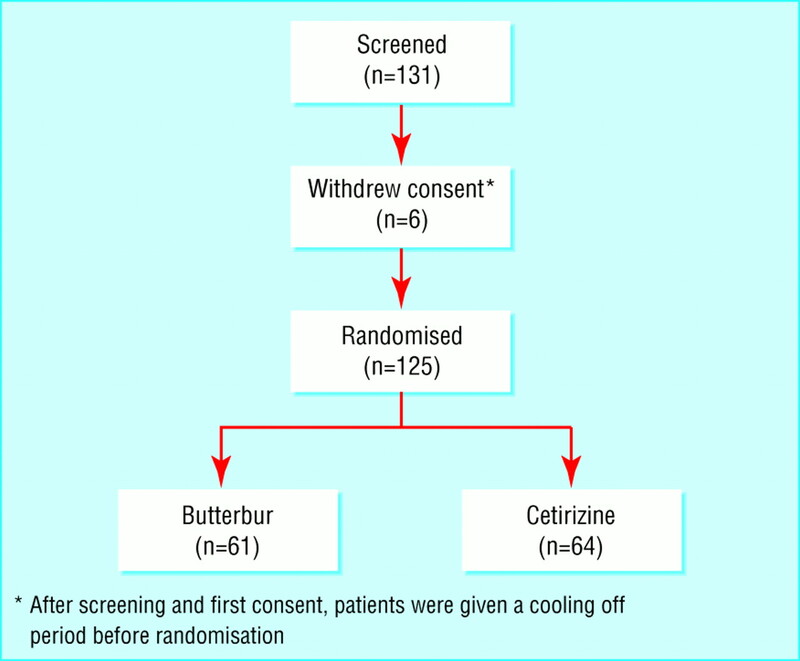 Analysis of the main outcome measures rejected the hypothesis of butterbur being inferior to cetirizine, with none of the scores in the butterbur group being more than 10% worse than in the cetirizine group. Analysis of the second outcome measures also showed no difference in efficacy between the two treatments. Exploratory analyses for between groups comparisons did not suggest a difference between the two treatments, although there were some trends in favour of the butterbur group. The overall incidence of adverse events was similar for the two treatments (table 3). No event could be considered to be typically associated with butterbur, all having been reported once or twice only. Conversely, two thirds of events in the cetirizine group were typical of antihistamines—that is, drowsiness and fatigue. One patient was withdrawn (butterbur group) because she required corticosteroids for previously existing asthma. Our randomised, double blind study showed that the effects of butterbur (ZE 339 extract tablets) are similar to those of cetirizine in patients with seasonal allergic rhinitis. Butterbur did not produce the sedative effects associated with antihistamines and was well tolerated by patients. The effects of this herbal treatment were confirmed by both patients and doctors. Although seasonal allergic rhinitis is common, methodologically robust studies are difficult to conduct, not least because of the easy access to anti-allergic treatments by patients. These treatments include a large number of antihistamines and corticosteroid nasal sprays available without prescription. To overcome the possible contamination of results by the use of other treatments, we monitored patients closely and allowed them to visit the clinics whenever they felt their condition needed further intervention. To enhance patient compliance, and bearing in mind the acutely debilitating symptoms of hay fever, we also kept the treatment period as short as possible (two weeks). In our experience, patients with this condition do not tolerate ineffective treatments for longer periods. We considered that the comparator treatment should be a non-sedating antihistamine as these are the first choice of treatment for seasonal allergic rhinitis. We also excluded the use of corticosteroids of any kind from two months before and during the study. We then formulated the hypothesis of whether this herbal treatment was inferior to the antihistamine prospectively in the protocol and tested the hypothesis hierarchically so that the analysis would stop if any of the tested items of the patients' self assessment showed inferiority for the herbal drug. The number of randomised controlled trials with herbal medicines has increased substantially recently.14–16 Herbal treatments are being used more often by doctors and, in our experience, are often requested by patients. Although the effects of butterbur have been linked to its constituents,6–8 we set out to test whether its clinical effects in seasonal allergic rhinitis were comparable to those of antihistamines as judged separately and blindly by patients and their doctors. The results showed that the effects of the two treatments are similar. The trends in favour of butterbur in some measures need to be confirmed in future prospective trials. With regard to safety, butterbur was well tolerated and did not have the sedative effects associated with antihistamines. Fatigue and drowsiness accounted for two thirds of adverse events reported in the antihistamine group. We have no data on whether the efficacy and tolerability of continued treatment with butterbur would be similar to antihistamines. However, treatment for this condition is usually relatively short, being restricted to peaks in pollen count during the spring and early summer. We believe butterbur should be considered for treating seasonal allergic rhinitis, particularly in cases where the sedative effects of antihistamines need to be avoided. Members of the study group were E Schrader (coordinator, Pohlheim), G Senti (Zurich), G Kunze (Rottweil), R Schellenberg (Hüttenberg), and J Dudeck and R H Boedeker (data audit and statistics, University of Giessen). Contributors: AS is the principal investigator and guarantor of the paper. Professor Dr J Dudeck (University of Giessen) was responsible for statistics and data management. Funding Zeller AG (Switzerland) supplied study medication and sponsored the study through the Clinical Research Organisation Praxis Klinische Arzneimittelforschung, Pohlheim, Germany. The interpretation of the results was the prerogative of the principal investigator and the study group. .Diseases of immediate type hypersensitivity. In:Harrison's principles of internal medicine. 9th ed. Tokyo: McGraw-Hill.,1981. .Allergic rhinitis: mechanisms and management.J Allergy Clin Immunol1988;81: 5;980–4. .Reduced allergen-induced nasal congestion and leukotriene synthesis with an orally active 5-lipoxygenase inhibitor.N Engl J Med1990;323: 1745–1748.
. Petasites hybridus. (accessed 28 November 2001). .Drogenmonographie Petasites.In: Hänsel R, Keller K, Rimpler H, Schneider G eds.Hagers Handbuch der pharmazeutischen Praxis. 5th ed. Berlin: Springer Verlag,1994:81–105. .Gastro-protective effects by extracts of Petasites hybridus: the role of inhibition of peptido-leukotriene synthesis.Planta Med1993;59: 494–496. .Identification and characterization of inhibitors of peptido-leukotriene-synthesis from Petasites hybridus.Planta Med1994;60: 318–322. .Role of petasine in the potential anti-inflammatory activity of a plant extract of petasites hybridus.Biochem Pharmacol2001;61: 1041–1047.
. Antihistamines, hyposensitisation, and allergic emergencies. In:British National Formulary. London: BMA, RPRSGB,1998. .Assessment of quality of life in patients with perennial allergic rhinitis with a French version of the SF-36 Health Status Questionnaire.J Allergy Clin Immunol1994;94: 182–188. .Improvement of quality of life by treatment with cetirizine in patients with perennial allergic rhinitis as determined by a French version of the SF-36 questionnaire.J Allergy Clin Immunol1996;98: 309–316.
. 028 CGI Clinical global impressions. In: Guy W ed.ECDEU assessment for psychopharmacology. Rockville, MD: NIMH,1976:217–222. .Descriptive data analysis: a concept between confirmatory and exploratory data analysis.Meth Inform1987;26: 77–88. .LI160, an extract of St John's wort versus amitriptyline in mildly to moderately depressed outpatients—a controlled 6-week clinical trial.Pharmacopsychiatry1997;30(suppl): 77–80. .Comparison of St John's wort and imipramine for treating depression: randomised controlled trial.BMJ2000;321: 536–539. .Treatment for the premenstrual syndrome with agnus castus fruit extract: prospective, randomised, placebo controlled study.BMJ2001;322: 134–137.